If yesterday's 10Y auction - the first under president-elect Donald Trump - was "deplorable", then today's was not much better. The auction priced at a high yield of 2.902%, tailing the When Issued 2.889% by 1.3 bps, one of the biggest tails in recent history. Furthermore, just like yesterday, the Bid to Cover collapsed, sliding from 2.439 in October to 2.107 despite the far higher yield, which was effectively matched with the BTC in February 2016, and before it the only lower one was in August of 2011 when the US was downgraded by S&P. The internals were just as ugly with Indirect Bidders tumbling from 65.4% to only 54.5%, the lowest since August of 2015. Directs took down 12.5% of the auction, leaving 33.1% to Dealers, roughly in line with average. 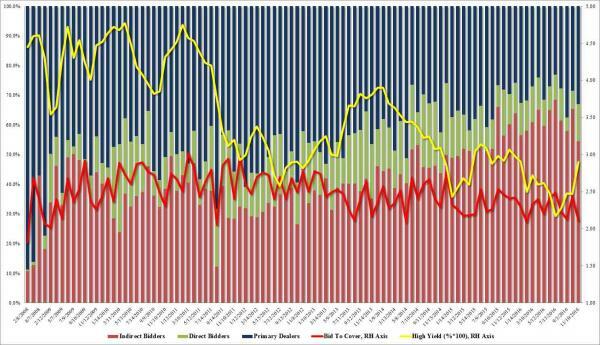 In summary: if yesterday's 10Y and today's 30Y are indicative of how "easy", or rather difficult it will be to sell debt for the Trump administration, the market may want to significantly reign in its expectations for a $5 trillion incremental boost to the US debt, which at this rate will only happen if the Fed is out there scooping it up in yet another QE operation. The bond vigilantes are finally stirring and all it took was president Donald Trump.